Chances are I don’t know you, but I already know you love mac and cheese. Everyone does. It’s one of the first foods we all eat, or learn how to make. Even if you’ve graduated from blue boxes and pouches of cheese powder to more refined versions of this delicacy, it’s comfort-food incarnate and it goes with everything so, frankly, it isn’t hard to pick some wine to drink with it. (Unlike, say, Cheetos.) 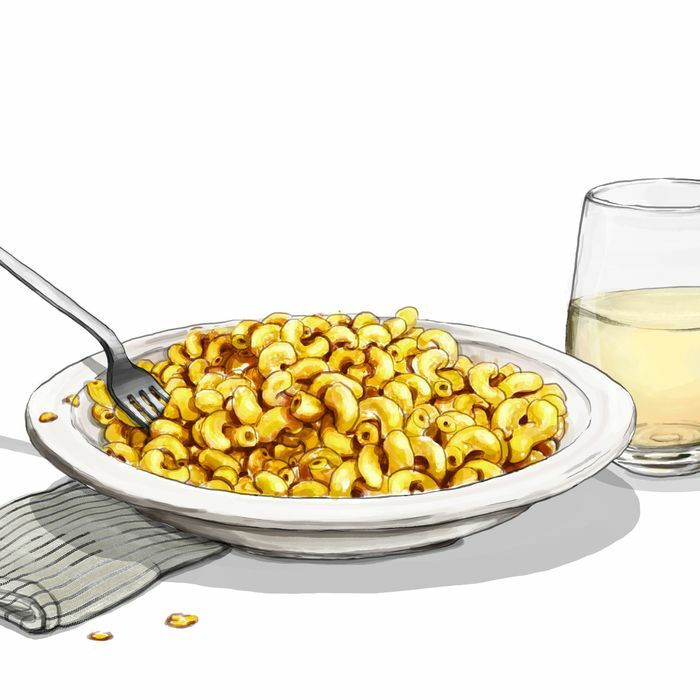 But while it might be tempting to grab something high in acid — or even something sparkling — mac and cheese is also perfect for what we in the biz call a congruent pairing. This means that instead of using contrasting textures and flavors to create a complementary pairing, we use similar flavors and textures to create that congruent balance — we’re basically doubling down on all the attributes that make the mac and cheese great to begin with. And that means we need a soft, opulent wine to match the soft, opulent food. So let’s grab some Viognier from France’s Rhône Valley. Here’s why it works: The entire reason mac and cheese exists in the first place is because it’s a big bowl of creamy comfort. So we want a soft, creamy wine, too. Viognier gives this in spades. Stick with me here while I get a little wine-geeky: When you taste Viognier, the wine starts subtly, but as it moves through your mouth it grows broader and develops a texture that feels almost oily. That’s exactly what we want because it’s a perfect match for the cheese sauce. As you swallow, the ever-so-slight bitterness of the wine cuts right up against the sharpness of the cheese. It’s like a perfect bite of self-care and you will instantly want another. This is interesting, actually, because Viognier is unique in the spectrum of white grapes. When you first smell it, you’re hit with all sorts of floral notes like rose petal and honeysuckle, plus bright citrus fruit such as bergamot, orange, and tangerine. They get you primed, but don’t let the sweet aromatics fool you — these wines are bone-dry. Home base for Viognier is the Rhône Valley, located in the southern part of France, and the priciest bottles come from an area in the Rhône called Condrieu. This appellation is famous among wine fans for good reason, and is worth experiencing if you ever find yourself able to visit, or track down a bottle of its wine. But before you book that plane ticket to France, these three bottles are a great place to get started. A lot of star power is behind this modestly priced wine, including Jeremy Seysses of Domaine Dujac fame, which has also captured the attention of hip-hop celebs such as Jay-Z and DJ Khaled. This is a traditional, bright style with delicious custardy notes of sumptuousness. Yes, this is expensive wine, and that’s because Condrieu is ground zero for superlative Viognier. And Verney, as a house, is ground zero for the renewal of this almost-forgotten appellation — their diligence is very much a driving force behind its newfound awareness and revival.